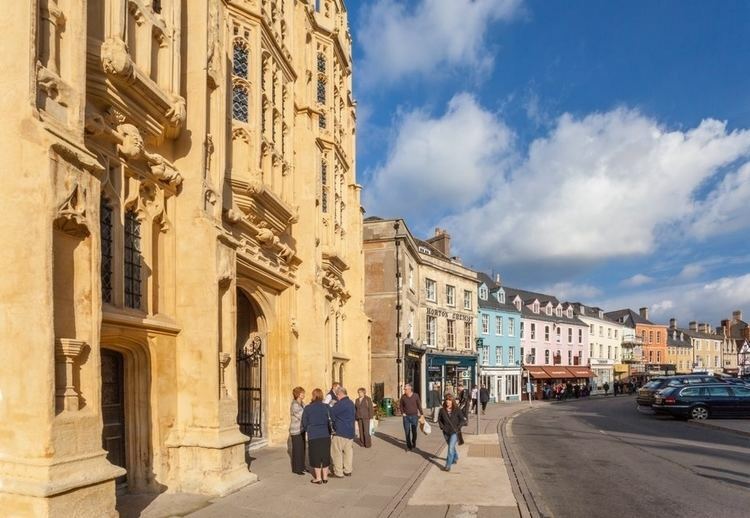 Cirencester (, occasionally ; see below for more variations) is a market town in east Gloucestershire, England, 93 miles (150 km) west northwest of London. Cirencester lies on the River Churn, a tributary of the River Thames, and is the largest town in the Cotswold District. It is the home of the Royal Agricultural University, the oldest agricultural college in the English-speaking world, founded in 1840. The town's Corinium Museum is well known for its extensive Roman collection. The Roman name for the town was Corinium, which is thought to have been associated with the ancient British tribe of the Dobunni, having the same root word as the River Churn. The earliest known reference to the town was by Ptolemy in AD 150. The town is split into five main areas: the town centre, the suburbs of Chesterton, Stratton (originally villages outside the town), Watermoor and The Beeches. The village of Siddington to the south of the town is now almost contiguous with Watermoor. Other suburbs include Bowling Green and New Mills.The area and population of these 5 electoral wards are identical to that quoted above. The town serves as a centre for surrounding villages, providing employment, amenities, shops, commerce and education, and as a commuter town for larger centres such as Cheltenham, Swindon and Stroud. Cirencester is the hub of a significant road network with important routes to Gloucester (A417), Cheltenham (A435), Warwick (A429), Oxford (A40 via the B4425 road), Wantage (A417), Swindon (A419), Chippenham (A429), Bristol, Bath (A433), and Stroud (A419). However, only Gloucester, Cheltenham, Stroud and Swindon have slow bus connections. These good roads bring the town passing trade. Although the ring road and bypass take traffic away from the town centre, both roads have busy service areas with adequate parking. 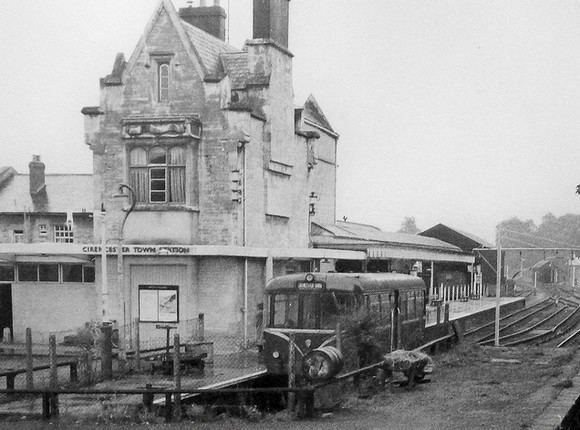 Since closure of the Kemble to Cirencester branch line to Cirencester Town in 1964 the town has become one of the largest in the region without its own rail station. However Kemble railway station, 4 miles away, serves as a railhead. It provides regular services between Swindon and Gloucester, with peak-time direct trains to London Paddington station. The nearest airports are Bristol Airport, Cotswold Airport at Kemble, London (Heathrow) and Birmingham. Cirencester is known to have been an important early Roman area, along with St. Albans and Colchester, and the town includes evidence of significant area roadworks. The Romans built a fort where the Fosse Way crossed the Churn, to hold two quingenary alae tasked with helping to defend the provincial frontier around AD 49, and native Dobunni were drawn from Bagendon, a settlement 3 miles (5 km) to the north, to create a civil settlement near the fort. When the frontier moved to the north after the conquest of Wales, this fort was closed and its fortifications levelled aound the year 70, but the town persisted and flourished under the name Corinium Dobunnorum. Even in Roman times, there was a thriving wool trade and industry, which contributed to the growth of Corinium. A large forum and basilica were built over the site of the fort, and archaeological evidence shows signs of further civic growth. There are many Roman remains in the surrounding area, including several Roman villas near the villages of Chedworth and Withington. When a wall was built around the Roman city in the late 2nd century, it enclosed 240 acres (1 km²), making Corinium the second-largest city by area in Britain. The details of the provinces of Britain following the Diocletian Reforms around 296 remain unclear, but Corinium is now generally thought to have been the capital of Britannia Prima. Some historians would date to this period the pillar erected by the governor Lucius Septimus to the god Jovian, a local sign of the pagan reaction against Christianity during the principate of Julian the Apostate. The Roman amphitheatre still exists in an area known as the Querns to the south-west of the town, but has only been partially excavated. Investigations in the town show that it was fortified in the 5th or 6th centuries. Andrew Breeze argued that Gildas received his later education in Cirencester in the early 6th century, showing that it was still able to provide an education in Latin rhetoric and law at that time. Possibly this was the palace of one of the British kings defeated by Ceawlin in 577. It was later the scene of the Battle of Cirencester, this time between the Mercian king Penda and the West Saxon kings Cynegils and Cwichelm in 628. The minster church of Cirencester, founded in the 9th or 10th century, was probably a royal foundation. It was made over to Augustinian canons in the 12th century, and replaced by the great abbey church. 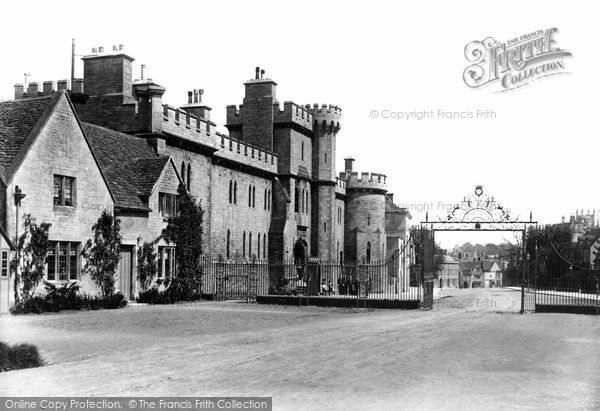 At the Norman Conquest the royal manor of Cirencester was granted to the Earl of Hereford, William Fitz-Osbern, but by 1075 it had reverted to the Crown. The manor was granted to Cirencester Abbey, founded by Henry I in 1117, and following half a century of building work during which the minster church was demolished, the great abbey church was finally dedicated in 1176. The manor was granted to the Abbey in 1189, although a royal charter dated 1133 speaks of burgesses in the town. The struggle of the townsmen to gain the rights and privileges of a borough for Cirencester probably began in the same year, when they were amerced for a false presentment. Four inquisitions during the 13th century supported the abbot's claims, yet the townspeople remained unwavering in their quest for borough status: in 1342, they lodged a Bill of complaint in Chancery. Twenty townspeople were ordered to Westminster, where they declared under oath that successive abbots had bought up many burgage tenenments, and made the borough into an appendage of the manor, depriving it of its separate court. They claimed that the royal charter that conferred on the men of Cirencester the liberties of Winchester had been destroyed 50 years earlier, when the abbot had bribed the burgess who held the charter to give it to him, whereupon the abbot had had it burned. In reply, the abbot refuted these claims, and the case passed on to the King's Bench. When ordered to produce the foundation charter of his abbey the abbot refused, apparently because that document would be fatal to his case, and instead played a winning card. In return for a fine of £300, he obtained a new royal charter confirming his privileges and a writ of supersedeas. Yet the townspeople continued in their fight: in return for their aid to the Crown against the earls of Kent and Salisbury, Henry IV in 1403 gave the townsmen a Guild Merchant, although two inquisitions reiterated the abbot's rights. The struggle between the abbot and the townspeople continued, with the abbot's privileges confirmed in 1408‑1409 and 1413, and in 1418 the abbot finally removed this thorn in his side when the guild merchant was annulled, and in 1477 parliament declared that Cirencester was not corporate. After several unsuccessful attempts to re-establish the guild merchant, in 1592 the government of the town was vested in the bailiff of the lord of the manor. As part of the Dissolution of the Monasteries in 1539, Henry VIII ordered the total demolition of the Abbey buildings. Today only the Norman Arch and parts of the precinct wall remain above ground, forming the perimeter of a public park in the middle of town. Despite this, the freedom of a borough continued to elude the townspeople, and they only saw the old lord of the manor replaced by a new lord of the manor as the King acquired the abbey's title. Sheep rearing, wool sales, weaving and woollen broadcloth and cloth-making were the main strengths of England's trade in the Middle Ages, and not only the abbey but many of Cirencester's merchants and clothiers gained wealth and prosperity from the national and international trade. The tombs of these merchants can be seen in the parish church, while their fine houses of Cotswold stone still stand in and around Coxwell Street and Dollar Street. Their wealth funded the rebuilding of the nave of the parish church in 1515–30, to create the large parish church, often referred to as the "Cathedral of the Cotswolds". Other wool churches can be seen in neighbouring Northleach and Chipping Campden. The English Civil War came to Cirencester in February 1643 when Royalists and Parliamentarians came to blows in the streets. Over 300 were killed, and 1,200 prisoners were held captive in the church. The townsfolk supported the Parliamentarians but gentry and clergy were for the old order, so that when Charles I of England was executed in 1649 the minister, Alexander Gregory, wrote on behalf of the gentry in the parish register, "O England what did'st thou do, the 30th of this month". At the end of the English Civil War King Charles II spent the night of 11 September 1651 in Cirencester, during his escape after the Battle of Worcester on his way to France. At the end of the 18th century Cirencester was a thriving market town, at the centre of a network of turnpike roads with easy access to markets for its produce of grain and wool. A local grammar school provided education for those who could afford it, and businesses thrived in the town, which was the major urban centre for the surrounding area. In 1789 the opening of a branch of the Thames and Severn Canal provided access to markets further afield, by way of a link through the River Thames. In 1841 a branch railway line was opened to Kemble to provide a link to the Great Western Railway at Swindon. The Midland and South Western Junction Railway opened a station at Watermoor in 1883. Cirencester thus was served by two railway lines until the 1960s. The loss of canal and the direct rail link encouraged dependency on road transport. An inner ring road system was completed in 1975 in an attempt to reduce congestion in the town centre, which has since been augmented by an outer bypass with the expansion of the A417 road. Coaches depart from London Road for Victoria Bus Station in central London and Heathrow Airport, taking advantage of the M4 Motorway. Kemble Station to the west of the town, distinguished by a sheltered garden, is served by fast trains from Paddington station via Swindon. In 1894 the passing of the Local Government Act brought at last into existence Cirencester's first independent elected body, the Urban District Council. 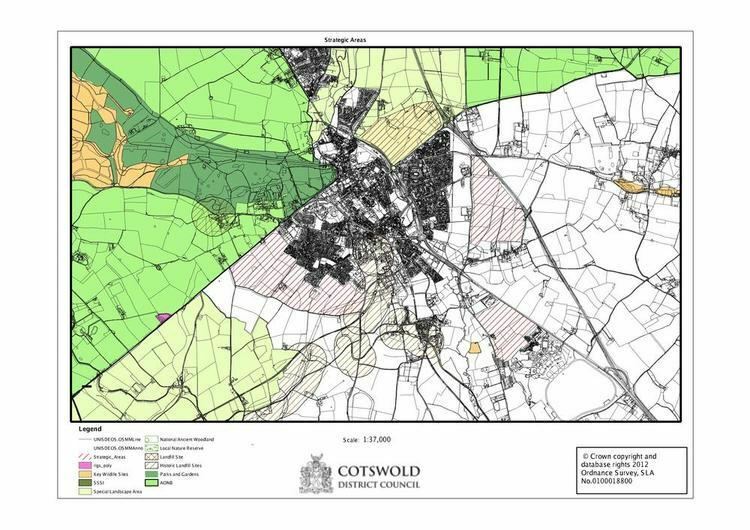 The reorganisation of the local governments in 1974 replaced the Urban District Council with the present two-tier system of Cotswold District Council and Cirencester Town Council. A concerted effort to reduce overhead wiring and roadside clutter has given the town some picturesque streetscenes. Many shops cater to tourists and many house family businesses. Under the patronage of the Bathurst family, the Cirencester area, notably Sapperton, became a major centre for the Arts and Crafts movement in the Cotswolds, when the furniture designer and architect-craftsman Ernest Gimson opened workshops in the early 20th century, and Norman Jewson, his foremost student, practised in the town. The Liberal Democrats are the dominant political party in Cirencester, gaining all 8 Cirencester seats available on Cotswold District Council in May 2015; despite this the Conservative Party still have an overall majority on the District Council. The Liberal Democrats also took 13 out of 15 seats on Cirencester Town Council at the 2015 local elections; rather than forming a political group, all Councillors agreed to work apolitically. The Liberal Democrats won the two County Council seats in the 2013 local elections. As of May 2017, the Mayor of Cirencester is Cllr Nigel Robbins. Liberal Democrat candidate Joe Harris, aged 18, was elected for Cirencester Park Ward in May 2011, and became the youngest Councillor in the country. In 2013 he became the youngest Mayor in British history when fellow Councillors elected him to the post at the age of 20. Harris was also elected to Gloucestershire County Council in the 2013 local elections, winning the Cirencester Park Division. The name stem Corin is cognate with Churn (the modern name of the river on which the town is built) and with the stem Cerne in the nearby villages of North Cerney, South Cerney, and Cerney Wick; also on the River Churn. The modern name Cirencester is derived from the cognate root Ciren and the standard -cester ending indicating a Roman fortress or encampment. It seems certain that this name root goes back to pre-Roman times and is similar to the original Brythonic name for the river, and perhaps the settlement. An early Welsh language ecclesiastical list from St David's gives another form of the name Caerceri where Caer is the Welsh for fortress and Ceri is cognate with the other forms of the name. Sometimes the form Cicester was heard instead. These forms are now very rarely used, while many local people abbreviate the name to Ciren . Today it is usually /ˈsaɪrənsɛstər/ (as it is spelt) or , although occasionally it is , or . 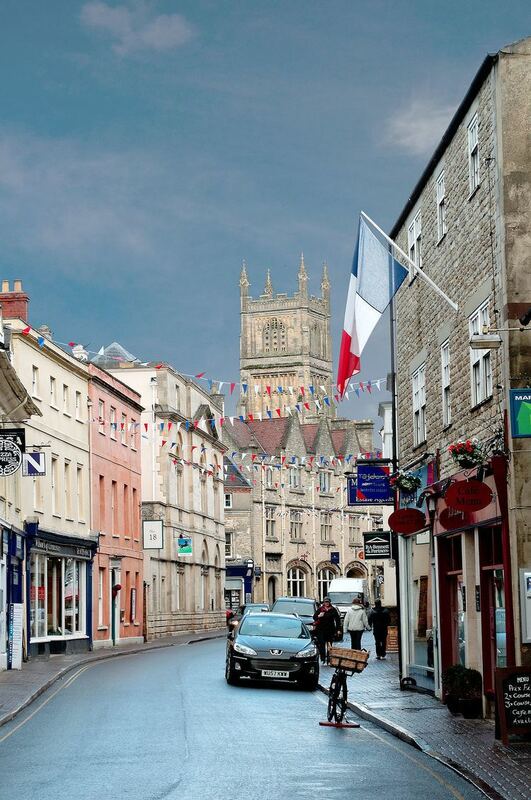 Cirencester has an important tourist trade as well as providing shopping, entertainment, and sports facilities for the inhabitants of the town and the surrounding area. The Church of St. John the Baptist, Cirencester is renowned for its Perpendicular Gothic porch, fan vaults and merchants' tombs. The town also has a Roman Catholic Church of St Peter's; the foundation stone was laid on 20 June 1895. Coxwell Street to the north of Market Square is home to the Baptist Church that was founded in 1651 – making it one of the oldest Baptist churches in England. Its current building was started in 1856. To the west of the town is Cirencester House, the seat of Earl Bathurst and the site of one of the finest landscape gardens in England, laid out by the first Earl Bathurst after 1714. Abbey House, Cirencester was a country house built on the site of the former Cirencester Abbey following its dissolution and demolition at the English Reformation in the 1530s. The site was granted in 1564 to Richard Master, physician to Queen Elizabeth I. The house was rebuilt and altered at several dates by the Master family, who still own the agricultural estate. By 1897 the house was let, and it remained in the occupation of tenants until shortly after the Second World War. It was finally demolished in 1964. On Cotswold Avenue is the site of a Roman amphitheatre which, while buried, retains its shape in the earthen topography of the small park setting. Cirencester was one of the most substantial cities of Roman-era Britain. In April 2006 the Cotswold Leisure Centre moved to its new site, the centre is run by the local district council. It includes a swimming pool, sauna, steam room, showers, relaxation area, a large sports hall, gym and fitness centre. The centre was closed for eight months to be repaired after the flooding in July 2007. The town also has an open-air swimming pool, dating back to 1870, this is run by a charity and local volunteers and is only open during the summer months. It also hosts Cotswold Gymnastics Club, which has a British 2nd place Veteran as a coach, as well as having won approximately 63 medals from between 2005 and 2009. It is at Deer Park School. The local football club, Cirencester Town F.C., are currently in the Southern League Premier Division as of 2011. The team is known as The Centurions, and moved in 2002 from their former ground at Smithsfield on the Tetbury Road to a purpose-built sports complex known as the Corinium Stadium. The club is designated by The Football Association as a Community Club because each week it provides football awareness, coaching, and competition, for over 300 children, ranging from age 6+ to 18. As well as the main pitch, there are six additional football pitches, mainly used by the junior football teams. The club has also developed a full-size indoor training area, known as The Arena, which is used for training, for social events, and for 5-a-side leagues throughout the year. Cirencester is served by two active athletics clubs, Cirencester Athletics and Triathlon Club and Running Somewhere Else. Cirencester Ladies Netball Club has three squads. The A team play in the 1st division of the Gloucestershire League. The B team in the 3rd Division and the C team in the 5th Division. The Rugby Club are based at the Whiteway. They have four main teams, a colts, a Youth and Mini sections. Cirencester Park Polo Club, founded in 1896, is the oldest polo club in the UK. Its main grounds are located in Earl Bathurst's Cirencester Park. It is frequently used by The Prince of Wales and his sons The Duke of Cambridge and Prince Harry. The town and the surrounding area have several primary schools and two secondary schools, Cirencester Deer Park School located on the Stroud Road and Cirencester Kingshill School off the London Road. It also offers an independent school, catering for 3- to 18-year-olds, Rendcomb College. The town used to have a 500-year-old grammar school, which in 1966 joined with the secondary modern to form Cirencester Deer Park School. In 1991 Cirencester College was created, taking over the joint sixth form of Cirencester Deer Park and Cirencester Kingshill schools and the Cirencester site of Stroud College; it is located adjacent to Deer Park School on the Stroud Road. Until 1994 the town hosted a privately run Preparatory school named Oakley Hall. Run in its later years by the Letts family it closed in 1994 shortly after the retirement of R F B Letts who had led the school since 1962. The grounds of the school are now mostly occupied by housing. The town also hosts the Royal Agricultural University which is located between the Stroud and Tetbury Roads. The Sundial Theatre, part of Cirencester College, and the Bingham Hall host drama and musical events by community groups and professional touring companies. Cirencester Operatic Society, Cirencester Philharmonia Orchestra, Cirencester Band, Cirencester Male Voice Choir and Cirencester Creative Dance Academy are also based in the town.